Colorado Criminal Restitution Law – Can A Victim Collect For Future Restitution Unknown At Sentencing? There is confusion in the law when it comes to Court orders for restitution when the issue is future lost wages or other kinds of future costs. other losses or injuries proximately caused by an offender’s conduct and that can be reasonably calculated and recompensed in money. Colorado’s Supplemental Restitution Statute § 18-1.3-603 is the key statute. Section 18-1.3-603 is reprinted in it’s entirety at the end of this article. Understanding an order for restitution is ciritical because the non-payment of restitution can lead to a violation of probation. A Judge, in a Colorado criminal case, has the authority to reserve the restitution for future losses. That has not always been the case. Prior to 2000, Colorado the law did not provide a way for a Court to modify an order of restitution once it was ordered and the sentence commenced. Then, in 2000 the Colorado restitution statute was amended – greatly increasing the Judge’s authority to order restitution and to provide for future restitution costs. What some lawyers view as the “91 day rule” – the period of time Judge’s give to the State to determine the amount of restitution order – does NOT LIMIT that Judge from amending the order to include future restitution costs. The ninety-day period of limitation applies only to efforts to procure an initial order of restitution and not to efforts to increase a previously entered order for restitution. 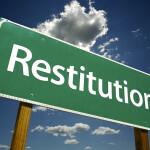 The restitution statute authorizes an increase in restitution when a previous restitution order was not final. The restitution statute requires, however, that neither the prosecution nor the court knew of the additional expenses prior to the amendment. Neither the statute nor defendant’s double jeopardy rights are violated by an increase in the restitution obligation if the requirements of the statute are followed. (d) Contain a specific finding that no victim of the crime suffered a pecuniary loss and therefore no order for the payment of restitution is being entered. (2) The court shall base its order for restitution upon information presented to the court by the prosecuting attorney, who shall compile such information through victim impact statements or other means to determine the amount of restitution and the identities of the victims. Further, the prosecuting attorney shall present this information to the court prior to the order of conviction or within ninety-one days, if it is not available prior to the order of conviction. The court may extend this date if it finds that there are extenuating circumstances affecting the prosecuting attorney’s ability to determine restitution. (II) If the defendant has otherwise compensated the victim or victims for the pecuniary losses suffered. (4) (a) Any order for restitution entered pursuant to this section shall be a final civil judgment in favor of the state and any victim. Notwithstanding any other civil or criminal statute or rule, any such judgment shall remain in force until the restitution is paid in full. The provisions of article 18.5 of title 16, C.R.S., apply notwithstanding the termination of a deferred judgment and sentence or a deferred adjudication. (II) The defendant owes all reasonable and necessary attorney fees and costs incurred in collecting such order due to the defendant’s nonpayment. (c) The entry of an order for restitution under this section creates a lien by operation of law against the defendant’s personal property and any interest that the defendant may have in any personal property. (d) Any order of restitution imposed shall be considered a debt for “willful and malicious” injury for purposes of exceptions to discharge in bankruptcy as provided in 11 U.S.C. sec. 523. (5) If more than one defendant owes restitution to the same victim for the same pecuniary loss, the orders for restitution shall be joint and several obligations of the defendants. (6) Any amount paid to a victim under an order of restitution shall be set off against any amount later recovered as compensatory damages by such victim in any federal or state civil proceeding. (7) When a person’s means of identification or financial information was used without that person’s authorization in connection with a conviction for any crime in violation of part 2, 3, or 4 of article 4, part 1, 2, 3, or 7 of article 5, or article 5.5 of this title, the sentencing court may issue such orders as are necessary to correct a public record that contains false information resulting from any violation of such laws. In addition, the restitution order shall include any costs incurred by the victim related to section 16-5-103, C.R.S. (8) (a) Notwithstanding the provisions of subsection (1) of this section, for a non-felony conviction under title 42, C.R.S., the court shall order restitution concerning only the portion of the victim’s pecuniary loss for which the victim cannot be compensated under a policy of insurance, self-insurance, an indemnity agreement, or a risk management fund. (III) Any other insurance or indemnity agreement that would indemnify the defendant for any damages sustained by the victim. (c) (I) Except as otherwise provided in this paragraph (c), a court may not award restitution to a victim concerning a pecuniary loss for which the victim has received or is entitled to receive benefits or reimbursement under a policy of insurance or other indemnity agreement. (II) (A) A court may award a victim restitution for a deductible amount under his or her policy of insurance. (II) Nothing in this paragraph (d) shall prohibit a nonowner driver or passenger in the vehicle from being awarded restitution if the driver or passenger was not covered by his or her own medical payments coverage policy. (e) (I) Notwithstanding any provision of law to the contrary, an insurance company, risk management fund, or public entity shall not be obligated to defend a defendant in a hearing concerning restitution. No court shall interpret an indemnity or insurance contract so as to obligate an insurance company, risk management fund, or public entity to defend a defendant at a restitution hearing absent a specific agreement. (II) Notwithstanding any provision of law, indemnity contract, or insurance contract to the contrary, an insurance company, risk management fund, or public entity shall not be obligated to pay or otherwise satisfy a civil judgment entered pursuant to this part 6, or to indemnify a defendant for an amount awarded in a restitution order. (f) Nothing in this article shall be construed to limit or abrogate the rights and immunities set forth in the “Colorado Governmental Immunity Act”, article 10 of title 24, C.R.S. (g) The provisions of this subsection (8) shall not preclude the court, pursuant to article 4.1 of title 24, C.R.S., from ordering restitution to reimburse an expenditure made by a victim compensation fund. (9) For a conviction for human trafficking for involuntary servitude, as described in section 18-3-503, or for human trafficking for sexual servitude, as described in section 18-3-504, the court shall order restitution, if appropriate, pursuant to this section even if the victim is unavailable to accept payment of restitution. (10) (a) If, as a result of the defendant’s conduct, a crime victim compensation board has provided assistance to or on behalf of a victim pursuant to article 4.1 of title 24, C.R.S., the amount of assistance provided and requested by the crime victim compensation board is presumed to be a direct result of the defendant’s criminal conduct and must be considered by the court in determining the amount of restitution ordered. (c) Records of a crime victim compensation board relating to a claimed amount of restitution are subject to the provisions of section 24-4.1-107.5, C.R.S. If you found any of the information I have provided on this web page article helpful please click my Plus+1 or the Share buttons for Twitter and Face book below so that others may also find it. You should be careful to make a responsible choice in selecting a Colorado Criminal Defense Lawyer – and we encourage you to “vet” our firm. Over the last 30 plus years – by focusing ONLY on Colorado criminal law – H. Michael has had the necessary time to commit to the task of constantly updating himself on nearly every area of criminal law, to include Colorado criminal law and procedure and trial and courtroom practice. H. Michael works hard to get his clients the best possible results in and out of the courtroom. He has written, and continues to write, extensively on Colorado criminal law and he hopes this article helps you in some small way – Colorado Criminal Restitution Law – Can A Victim Collect For Future Restitution Unknown At Sentencing? Colorado Criminal Restitution Law - Can A Victim Collect For Future Restitution Unknown At Sentencing?